Mary Louise "Meryl" Streep (born June 22, 1949) is an American actress. 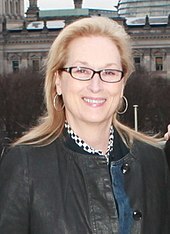 Often described as the "best actress of her generation", Streep is particularly known for her versatility and accent adaptation. Nominated for a record 21 Academy Awards, she has won three. Streep has received 31 Golden Globe nominations, winning eight - more nominations, and wins, than any other actor. She has also won three Primetime Emmy Awards and has been nominated for fifteen British Academy Film Awards, and seventeen Screen Actors Guild Awards, winning two each. The story within a story drama The French Lieutenant's Woman (1981) was Streep's first leading role. The film paired Streep with Jeremy Irons as contemporary actors, telling their modern story, as well as the Victorian era drama they were performing. 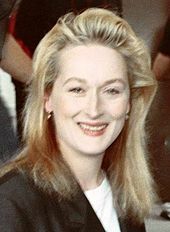 Streep perfected an English accent for the part, but considered herself a misfit for the role: " I couldn't help wishing that I was more beautiful". [lower-alpha 2] A New York magazine article commented that, while many female stars of the past had cultivated a singular identity in their films, Streep was a "chameleon", willing to play any type of role. 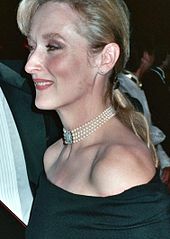 Streep was awarded a BAFTA Award for Best Actress in a Leading Role for her work. The following year, she re-united with Robert Benton for the psychological thriller, Still of the Night (1982), co-starring Roy Scheider and Jessica Tandy. Vincent Canby, writing for The New York Times, noted that the film was an homage to the works of Alfred Hitchcock, but that one of its main weaknesses was a lack of chemistry between Streep and Scheider, concluding that Streep "is stunning, but she's not on screen anywhere near long enough". Longworth notes that the dramatic success of Out of Africa led to a backlash of critical opinion against Streep in the years that followed, especially as she was now demanding $4 million a picture. 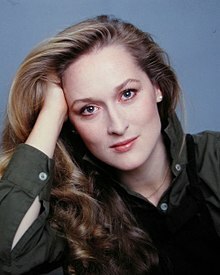 Unlike other stars at the time, such as Sylvester Stallone and Tom Cruise, Streep "never seemed to play herself", and certain critics felt her technical finesse led people to literally see her acting. Her next films did not appeal to a wide audience; she co-starred with Jack Nicholson in the dramas Heartburn (1986) and Ironweed (1987), in which she sang onscreen for the first time since the television movie Secret Service (1977). In Evil Angels[lower-alpha 3] (1988), she played Lindy Chamberlain, an Australian woman who had been convicted of the murder of her infant daughter despite claiming that the baby had been taken by a dingo. Filmed in Australia, Streep won the Australian Film Institute Award for Best Actress in a Leading Role, a Best Actress at the Cannes Film Festival, and the New York Film Critics Circle Award for Best Actress. Streep has said of perfecting the Australian accent in the film: "I had to study a little bit for Australian because it's not dissimilar [to American], so it's like coming from Italian to Spanish. You get a little mixed up." Vincent Canby of The New York Times referred to her performance as "another stunning performance", played with "the kind of virtuosity that seems to re-define the possibilities of screen acting". Women are better at acting than men. Why? Because we have to be. If successfully convincing somebody bigger than you of something he doesn't know is a survival skill, this is how women have survived through the millennia. Pretending is not just play. Pretending is imagined possibility. Pretending or acting is a very valuable life skill, and we all do it. All the time. ↑ Streep's initial impression of Hoffman had been a negative one, thinking him to have been an "obnoxious pig" when she had first met him on stage several years earlier, and Hoffman had admitted that he initially "hated her guts", but respected her as an actress. ↑ Despite Streep's own negative self-body-image, President Obama, while presenting the Kennedy Center Honors, remarked, "Anyone who saw The French Lieutenant's Woman had a crush on her ..."
↑ The film was released in Australia as Evil Angels. ↑ Hollinger 2006, pp. 94-95. ↑ Negra, Diane; Holmes, Su (2011). In the Limelight and Under the Microscope. p. 120. ISBN 9781441176929. Archived from the original on May 6, 2016. ↑ Gajanan, Mahita (January 23, 2018). "How Many Oscars Has Meryl Streep Won In Total?". Time. ↑ "Meryl Streep's profile". Golden Globe Award. ↑ Kate Andersen Brower (March 2, 2011). "Obama Honors Meryl Streep, James Taylor, Harper Lee at Ceremony". Bloomberg. Archived from the original on February 17, 2015. Retrieved July 3, 2015. ↑ "Barack Obama jokes with Stevie Wonder and Meryl Streep at Presidential Medal of Freedom ceremony". The Guardian. November 25, 2014. Archived from the original on July 4, 2015. Retrieved July 3, 2015. ↑ "Moore wins film award". The Age. February 23, 2003. Archived from the original on April 8, 2016. Retrieved July 3, 2015. ↑ "Meryl Streep Will Be Honored With the 2017 Cecil B. DeMille Award At The Golden Globes". AwardsDaily.com. November 3, 2016. Archived from the original on November 4, 2016. Retrieved November 3, 2016. ↑ Magill 1995, p. 1697. 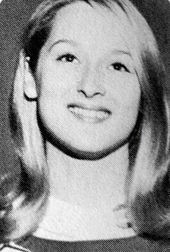 1 2 "Meryl Streep Biography (1949-)". Film Reference.com. Archived from the original on January 11, 2009. Retrieved January 16, 2009. ↑ Probst 2012, p. 7. 1 2 Louis Gates Jr., p. 40. ↑ Britten, Nick (February 14, 2012). "Baftas: Meryl Streep's British ancestor 'helped start war with Native Americans'". The Daily Telegraph. London. Archived from the original on October 16, 2015. 1 2 "Meryl Streep". Faces of America. 2010. Archived from the original on February 8, 2010. Retrieved February 5, 2010. 1 2 "Meryl Streep". PBS. January 4, 2010. Archived from the original on December 30, 2014. Retrieved January 20, 2015. ↑ McKenzie, Joi-Marie (February 4, 2010). "Henry Louis Gates Says He Broke Meryl Streep's Heart". Niteside. Archived from the original on January 31, 2012. Retrieved February 4, 2010. ↑ "Meryl Streep's great grandparents from Dunfanaghy". Donegal News. January 15, 2014. Archived from the original on February 23, 2014. Retrieved April 20, 2014. 1 2 3 4 Brockes, Emma (September 23, 2006). "The devil in Ms Streep". The Guardian. Archived from the original on July 3, 2015. Retrieved July 2, 2015. 1 2 3 4 "Here's Where Meryl Streep Found the Confidence to Become an Actress". Vanity Fair. June 19, 2015. Archived from the original on June 22, 2015. Retrieved July 2, 2015. ↑ Horowitz, Joy (March 17, 1991). "That Madcap Meryl. Really!". The New York Times. Archived from the original on November 11, 2012. Retrieved January 13, 2009. 1 2 3 4 5 Longworth 2013, p. 7. ↑ "Meryl Streep: Movies, marriage, and turning sixty". The Independent. January 24, 2009. Archived from the original on November 25, 2011. Retrieved November 24, 2011. ↑ "WATCH: Meryl Streep's alma mater Bernards High featured in Oscars 'Good Morning America' segment". 1 2 3 4 Longworth 2013, p. 8. 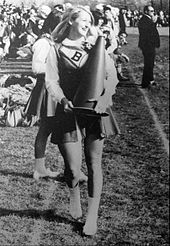 ↑ "Yale library's list of all roles played at Yale by Meryl Streep". Archived from the original on July 27, 2010. Retrieved March 7, 2010. ↑ Gussow 1998, p. 265. ↑ Gussow, Mel (January 7, 1991). "Critic's Notebook; Luring Actors Back to the Stage They Left Behind". The New York Times. Archived from the original on May 30, 2013. Retrieved March 7, 2010. ↑ Mason, Jeff (December 3, 2017). "Without Trump, Kennedy Center celebrates Lionel Richie and Gloria Estefan". Reuters. Archived from the original on December 26, 2017. Retrieved December 27, 2017. 1 2 3 4 5 Longworth 2013, p. 10. ↑ Pfaff & Emerson 1987, p. 16. 1 2 Contemporary Biography, Women: Original profiles. American Biography Service, Inc. 1983. p. 290. Archived from the original on May 6, 2016. ↑ "Henry V Joseph Papp Public Theater/New York Shakespeare Festival". Lortel Archives. Lucille Lortel Foundation. Archived from the original on April 10, 2015. Retrieved May 13, 2015. ↑ "Measure for Measure Joseph Papp Public Theater/New York Shakespeare Festival". Lortel Archives. Lucille Lortel Foundation. Archived from the original on April 10, 2015. Retrieved May 13, 2015. ↑ "The Taming of the Shrew Joseph Papp Public Theater/New York Shakespeare Festival". Lortel Archives. Lucille Lortel Foundation. Archived from the original on May 18, 2015. Retrieved May 13, 2015. ↑ Levy, Rochelle L. "2004 Meryl Streep tribute". American Film Institute. Archived from the original on February 21, 2015. Retrieved January 20, 2015. ↑ Lowell, Katherine. Show Business. Clinton Gilkie. p. 2001. GGKEY:XQ5TU8D6L6X. 1 2 Fisher 2011, p. 772. ↑ Longworth 2013, p. 21. ↑ "On the anniversary of his death, revisit John Cazale's tragically short film career in I Knew It Was You". The A.V. Club. Archived from the original on September 23, 2015. Retrieved September 22, 2015. ↑ Longworth 2013, pp. 19-21. ↑ Gray, Paul (December 3, 1979). "Cinema: A Mother Finds Herself". Time. p. 3. Archived from the original on January 21, 2015. Retrieved February 16, 2011. 1 2 Hollinger 2006, p. 81. ↑ Longworth 2013, p. 19. ↑ Longworth 2013, p. 32. ↑ "The 51st Academy Awards (1979) Nominees and Winners". Academy of Motion Picture Arts and Sciences (AMPAS). Archived from the original on April 2, 2015. Retrieved July 4, 2015. ↑ "Magazines Archive". SimplyStreep.com. Retrieved June 7, 2009. [dead link] citing "Star Treks". Horizon Magazine. August 1978. ↑ Longworth 2013, p. 26. ↑ "Meryl Streep Emmy Award Winner". Emmy Award. Archived from the original on September 5, 2014. Retrieved April 20, 2014. 1 2 Longworth 2013, p. 44. ↑ "The Manhattan Dilemma". SuperbHub.com. September 21, 2017. ↑ Hollinger 2006, p. 71. 1 2 3 Longworth 2013, p. 41. ↑ Hollinger 2006, p. 75. ↑ Hollinger 2006, p. 77. ↑ "Meryl Streep Knows Her Work". SuperbHub.Com. September 21, 2017. 1 2 Longworth 2013, p. 46. ↑ "The 52nd Academy Awards | 1980". Oscars. Academy of Motion Picture Arts and Sciences. Archived from the original on April 2, 2015. Retrieved May 13, 2015. 1 2 3 4 "Meryl Streep | 29 Nominations | 8 Wins". Golden Globes. Hollywood Foreign Press Association. Archived from the original on July 2, 2015. Retrieved May 13, 2015. ↑ Lenburg 2001, p. 167. ↑ Current Biography Yearbook. 41. H. W. Wilson Co. 1980. p. 391. Archived from the original on May 7, 2016. ↑ Sterling 1997, p. 444. ↑ Devine 1999, p. 171. ↑ Chivers, Tom (March 3, 2010). "Oscars 2010: the 10 worst injustices in Academy Award history". The Daily Telegraph. Archived from the original on July 12, 2015. Retrieved July 4, 2015. 1 2 3 Longworth 2013, p. 49. ↑ Palmer & Bray 2013, p. 227. 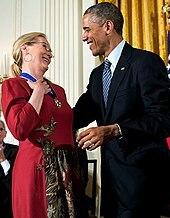 ↑ "Barack Obama reveals Meryl Streep 'crush' at Kennedy Centre Honours". The Telegraph. December 5, 2011. Archived from the original on July 11, 2015. Retrieved July 2, 2015. 1 2 Denby, David (September 21, 1981). "Meryl Streep is Madonna and siren in The French Lieutenant's Woman". New York. p. 27. Archived from the original on January 16, 2013. Retrieved June 15, 2009. ↑ "Film Actress in 1982". British Academy of Film and Television Arts. Archived from the original on January 21, 2015. Retrieved January 16, 2015. ↑ Canby, Vincent (September 20, 1985). "'Still of the Night', in Hitchcock Manner". The New York Times. Archived from the original on August 15, 2014. Retrieved June 6, 2009. ↑ Snider, Eric D. (October 20, 2011). "What's the Big Deal? : Sophie's Choice (1982)". Film.com. MTV Networks. Archived from the original on July 2, 2015. Retrieved May 13, 2015. ↑ "Picks and Pans Review: Sophie's Choice". People. January 24, 1983. Archived from the original on May 18, 2015. Retrieved May 13, 2015. ↑ Lloyd & Robinson 1988, p. 452. ↑ Skow, John (September 7, 1981). "What Makes Meryl Magic". Time. Archived from the original on September 4, 2009. Retrieved June 15, 2009. ↑ "Meryl Streep Academy Awards Acceptance Speech". Academy of Motion Picture Arts and Sciences. Archived from the original on February 27, 2015. Retrieved January 16, 2015. ↑ "Premiere Magazine's Top 100 Greatest Performances". Empire. March 20, 2006. Archived from the original on April 18, 2015. Retrieved July 2, 2015. ↑ Ebert 2010, p. 222. ↑ Longworth 2013, pp. 62, 53. ↑ Longworth 2013, p. 69. 1 2 Ebert 2006, p. 64. ↑ Longworth 2013, p. 78. ↑ Ebert, Roger (November 19, 1982). "'Plenty' review". Chicago Sun-Times. Archived from the original on June 16, 2010. Retrieved June 6, 2009. ↑ Longworth 2013, p. 92. ↑ Longworth 2013, p. 81. ↑ Longworth 2013, p. 88. ↑ Earls, John (10 January 2019). "'Bohemian Rhapsody' is the worst-reviewed Golden Globes winner in 33 years". NME. Retrieved 11 January 2019. ↑ Longworth 2013, p. 93. ↑ Longworth 2013, p. 97. 1 2 Waldo 2006, p. 209. 1 2 Speed & Wilson 1989, p. 38. ↑ Eberwein p.217 2010, p. 217. ↑ Newsweek 1988, p. 85. 1 2 3 Eberwein 2010, p. 221. ↑ Canby, Vincent (November 11, 1988). "A Cry in the Dark". The New York Times. Archived from the original on July 4, 2015. Retrieved July 2, 2015. 1 2 Longworth 2013, p. 99. ↑ Longworth 2013, p. 106. ↑ Corliss, Richard (December 11, 1989). "Warty Worm, "She-Devil" review". Time. Archived from the original on September 6, 2009. Retrieved June 7, 2009. 1 2 Hollinger 2006, p. 78. ↑ "SAG History - SAG Timeline". Archived from the original on January 25, 2012. Retrieved July 15, 2013. ↑ Longworth 2013, pp. 100, 103. ↑ Longworth 2013, p. 103. ↑ Longworth 2013, p. 100. 1 2 Longworth 2013, p. 107. ↑ Corliss, Richard (August 3, 1992). "Beverly Hills Corpse, "Death Becomes Her" review". Time. Archived from the original on September 4, 2009. Retrieved June 7, 2009. ↑ "The House of the Spirits". Rotten Tomatoes. Flixster. Archived from the original on March 30, 2015. Retrieved April 9, 2015. ↑ "The House of the Spirits". Rottentomatoes.com. Archived from the original on June 12, 2015. Retrieved July 2, 2015. ↑ Travers, Peter (September 20, 1994). "The River Wild". Rolling Stone. New York City: Wenner Media LLC. Archived from the original on May 5, 2015. Retrieved May 5, 2015. ↑ McGilligan 1999, p. 492. ↑ Longworth 2013, pp. 111-112. ↑ Longworth 2013, p. 115. 1 2 McGilligan 1999, p. 503. 1 2 3 4 Longworth 2013, p. 16. ↑ Longworth 2013, p. 117. ↑ Mitchell 2001, p. 139. ↑ Ebert, Roger (January 10, 1997). "Review- Marvin's Room". Chicago Sun-Times. Chicago, Illinois: Sun-Times Media Group. Archived from the original on January 10, 2006. Retrieved March 25, 2006. ↑ Allon et al. 2001, p. 255. ↑ Maslin, Janet (November 13, 1998). "Dancing at Lughnasa (1998)". The New York Times. New York City: New York Times Company. Archived from the original on July 4, 2015. Retrieved July 2, 2015. ↑ LaSalle, Mick (September 18, 1998). "Home Is a Beautiful 'Thing' / Streep shines in drama about ailing mother". San Francisco Chronicle. San Francisco, California: Hearst Corporation. Archived from the original on April 13, 2009. Retrieved May 1, 2015. ↑ Turan, Kenneth (September 18, 1998). "One True Thing". Los Angeles Times. Los Angeles, California: Tronc. 1 2 Hoffman, Barbara (October 24, 1999). "MAKING 'MUSIC' : WES CRAVEN MOVES FROM VIOLENCE TO VIOLINS". New York Post. New York City: News Corp. Archived from the original on November 16, 2017. ↑ Caparrós 2001, p. 91. ↑ Ebert, Roger (October 29, 1999). "Music of the Heart Movie Review". Chicago Sun-Times. Chicago, Illinois: Sun-Times Media Group. Archived from the original on September 28, 2012. Retrieved May 1, 2015. ↑ "A.I. Artificial Intelligence (2001)". Archived from the original on February 15, 2009. Retrieved February 7, 2009. ↑ "Previous Concerts (2001)". Nobelpeaceprize.org. Archived from the original on July 25, 2013. Retrieved July 3, 2015. ↑ "Meryl Streep and Liam Neeson Host The Nobel Peace Prize 100th Anniversary Concert". PR Newswire. Archived from the original on July 4, 2015. Retrieved July 3, 2015. ↑ Brantley, Ben (August 31, 2001). "Theater Review: Streep Meets Chekhov, Up in Central Park". The New York Times. Archived from the original on February 12, 2011. Retrieved February 13, 2011. ↑ "Adaptation (2002)". Rotten Tomatoes. Flixster. Archived from the original on April 11, 2008. Retrieved April 8, 2008. ↑ A. O. Scott (December 6, 2002). "Adaptation". The New York Times. Archived from the original on June 30, 2015. Retrieved July 2, 2015. ↑ "The Hours (2002) Details". The New York Times. Archived from the original on October 26, 2013. Retrieved May 13, 2015. ↑ "Meryl Streep: Biography". TV Guide. Archived from the original on January 31, 2009. Retrieved January 23, 2009. ↑ "The Manchurian Candidate (2003)". Archived from the original on February 5, 2010. Retrieved February 7, 2010. ↑ LaSalle, Mick (July 30, 2004). "Terrorist attacks, corporate control, election controversy: Sound familiar? 'The Manchurian Candidate' has it all". San Francisco Chronicle. Archived from the original on May 30, 2010. Retrieved May 30, 2010. ↑ "Lemony Snicket's A Series of Unfortunate Events". Rotten Tomatoes. Flixster. Archived from the original on February 28, 2009. Retrieved April 8, 2009. ↑ "Lemony Snicket's A Series of Unfortunate Events (2004)". Archived from the original on February 21, 2010. Retrieved February 10, 2010. ↑ ""Monet's Palate - A Gastronomic View From the Gardens of Giverny" with Meryl Streep Is a Film About Claude Monet". PRWeb. February 6, 2006. Archived from the original on January 16, 2013. Retrieved November 19, 2011. ↑ "Prime (2004)". Archived from the original on February 3, 2010. Retrieved February 10, 2010. ↑ Ebert, Roger. "Prime (2005)". Chicago Sun-Times. Archived from the original on June 3, 2013. Retrieved July 2, 2005. ↑ Brantley, Ben (August 22, 2006). "Mother Courage and Her Children". The New York Times. Archived from the original on February 13, 2009. Retrieved January 15, 2009. ↑ Ebert & Bordwell 2011, p. 562. ↑ "A Prairie Home Companion (2006)". Archived from the original on August 28, 2009. Retrieved February 10, 2010. ↑ Ebert, Roger (June 29, 2006). "The Devil Wears Prada". Chicago Sun-Times. Archived from the original on July 3, 2015. Retrieved July 2, 2015. ↑ Kidder & Oppenheim 2008, p. 347. ↑ Diller 2010, p. 41. ↑ "The Devil Wears Prada (2006)". Archived from the original on September 18, 2009. Retrieved February 10, 2010. ↑ "Streep Film Delayed Because of Campus Shooting". MSN. Associated Press. February 15, 2008. Archived from the original on June 23, 2011. Retrieved February 17, 2011. ↑ Alberge, Dalya (April 26, 2007). "Campus Massacre Films Face A Ban". The Times. London. Archived from the original on May 16, 2008. Retrieved February 17, 2011. ↑ "Dark Matter (2007)". Rotten Tomatoes. Flixster. Archived from the original on April 19, 2008. Retrieved April 11, 2008. ↑ Markon, Jerry (May 19, 2006). "Lawsuit Against CIA Is Dismissed". The Washington Post. Archived from the original on February 4, 2011. Retrieved October 11, 2008. ↑ "Meryl Streep Plays With Politics". Artisan News Service. YouTube. November 12, 2007. Archived from the original on July 27, 2013. Retrieved February 19, 2011. ↑ "Rendition (2007)". Archived from the original on February 8, 2010. Retrieved February 10, 2010. ↑ "Rendition (2007)". Rotten Tomatoes. Flixster. Archived from the original on May 22, 2011. Retrieved February 11, 2011. ↑ Jacobs, Jay S. (June 27, 2007). "Some Enchanted Evening". Pop Entertainment. Archived from the original on November 28, 2010. Retrieved February 17, 2011. ↑ "Evening (2007)". Rotten Tomatoes. Flixster. Archived from the original on December 12, 2010. Retrieved February 11, 2011. ↑ "Evening (2007)". Archived from the original on December 31, 2009. Retrieved February 10, 2010. ↑ "Lions for Lambs". Themoviereport.com. Archived from the original on April 13, 2015. Retrieved July 2, 2015. ↑ Mansfield, Paul (July 15, 2008). "Mamma Mia! Unfazed by the Fuss in Skopelos". The Daily Telegraph. London. Archived from the original on February 10, 2010. Retrieved May 12, 2010. ↑ "Mamma Mia! (2008)". Archived from the original on January 2, 2010. Retrieved February 5, 2009. ↑ "Genres: Musical". Archived from the original on May 23, 2017. Retrieved February 5, 2009. ↑ Morris, Wesley (July 18, 2008). "Abba-cadabra". The Boston Globe. Archived from the original on May 25, 2010. Retrieved February 20, 2011. ↑ "Doubt (2008)". Archived from the original on February 1, 2009. Retrieved February 5, 2009. ↑ "The 81st Academy Awards | 2009". Oscars. Academy of Motion Picture Arts and Sciences. Archived from the original on November 10, 2014. Retrieved May 13, 2015. ↑ Ebert, Roger. "Doubt". Chicago Sun-Times. Archived from the original on March 26, 2015. Retrieved July 2, 2015. ↑ Vance, Kelly (December 10, 2008). "She-Wolves of Hollywood". The East Bay Express. Archived from the original on July 3, 2015. Retrieved July 2, 2015. ↑ Morency 2012, p. 131. ↑ Gans, Andrew (February 2, 2010). "Academy Award Nominations Announced Feb. 2; "Nine" Receives Four Noms". Playbill. Archived from the original on February 4, 2010. Retrieved January 17, 2012. ↑ Potts 2011, p. 180. ↑ Peck, Tom (July 2, 2010). "Meryl Streep takes on her toughest role: the Iron Lady". The Independent. London. Archived from the original on June 24, 2011. Retrieved January 26, 2011. ↑ Showbiz, Bang (January 12, 2011). "Meryl Streep attends parliament for Thatcher research". The Independent. UK. Archived from the original on March 27, 2012. Retrieved February 29, 2012. ↑ "Image of Meryl Streep as Margaret Thatcher unveiled". BBC News. February 8, 2011. Archived from the original on February 9, 2011. Retrieved February 8, 2011. ↑ "2012 GOLDEN GLOBES Nominees and Winners - Complete List!". Broadwayworld.com. April 13, 2014. Archived from the original on October 14, 2013. Retrieved April 20, 2014. ↑ Perlman, Jake (February 12, 2012). "BAFTA winners announced". Entertainment Weekly. Archived from the original on January 8, 2014. Retrieved April 20, 2014. ↑ Perlman, Jake (February 26, 2012). 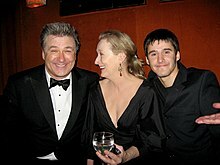 "Oscars winners list: 'The Artist', Jean Dujardin, and Meryl Streep take home top awards". Entertainment Weekly. Archived from the original on February 16, 2014. Retrieved April 20, 2014. ↑ Hope, Christopher (November 14, 2011). "The Iron Lady: Meryl Streep is 'cashing in' on Thatcher, say friends of former PM". The Daily Telegraph. London. Archived from the original on March 9, 2014. ↑ "Meryl Streep on Margaret Thatcher". The Wall Street Journal. April 8, 2013. Archived from the original on January 19, 2014. Retrieved April 20, 2014. ↑ "Hope Springs (2012)". Rotten Tomatoes. Flixster. Archived from the original on October 30, 2012. Retrieved October 22, 2012. ↑ "'12 Years a Slave' and 'American Hustle' lead Golden Globe nominees". Entertainment Weekly. December 12, 2013. Archived from the original on December 12, 2013. Retrieved January 17, 2014. ↑ Johnson, Zack (December 11, 2013). "Screen Actors Guild Awards 2014: Complete List of Nominations". Entertainment Weekly. Archived from the original on December 12, 2013. Retrieved January 17, 2014. ↑ "Oscars 2014: And the nominees are..." Entertainment Weekly. January 16, 2014. Archived from the original on January 16, 2014. Retrieved January 16, 2014. ↑ "Meryl Streep slams Walt Disney as racist, anti-Semitic". CBS News. January 8, 2014. Archived from the original on February 17, 2014. Retrieved April 20, 2014. ↑ "Critics: Facts don't back up Meryl Streep's Walt Disney bashing". Fox News Channel. January 10, 2014. Archived from the original on January 17, 2014. ↑ Storyboard (January 9, 2014). "In Defense of Walt Disney | The Walt Disney Family Museum". Waltdisney.org. Archived from the original on January 13, 2014. Retrieved April 20, 2014. ↑ Beaumont-Thomas, Ben (January 16, 2014). "Disney grandniece backs Meryl Streep on Walt's racism and sexism | Film". The Guardian. Archived from the original on March 8, 2014. Retrieved April 20, 2014. ↑ Jagernauth, Kevin (August 6, 2013). "Meryl Streep Joins YA Adaptation 'The Giver' With Jeff Bridges". Indiewire. Archived from the original on August 21, 2013. Retrieved August 22, 2013. ↑ Lasser, Josh (August 12, 2014). "Meryl Streep talks 'The Giver' and says 'I like to be boss'". Hitflix.com. Archived from the original on December 30, 2014. Retrieved December 30, 2014. ↑ "The Giver". Metacritic/CBS Interactive. Archived from the original on September 7, 2014. Retrieved September 9, 2014. ↑ "Meryl Streep & Hilary Swank Team For 'The Homesman'". Indiewire. September 27, 2012. Archived from the original on October 25, 2012. Retrieved October 22, 2012. ↑ "The Homesman". Rotten Tomatoes. Flixster. Archived from the original on December 28, 2014. Retrieved January 20, 2015. ↑ "SCOOP: Meryl Streep to Play the Witch in INTO THE WOODS Film; Arranger David Krane Confirms!". BroadwayWorld.com. Archived from the original on February 4, 2013. Retrieved January 31, 2013. ↑ "Roxbury Composer's Future: New Town, Working with Meryl Streep as a Witch". Litchfield Country Times. Archived from the original on February 15, 2013. Retrieved January 31, 2013. ↑ "Meryl Streep Will Head into The Woods With Rob Marshall". Cinema Blend. February 2013. Archived from the original on February 5, 2013. Retrieved February 1, 2013. ↑ "Meryl Streep to play the Witch in 'Into the Woods' film adaptation". Hypable. February 2013. Archived from the original on December 8, 2015. ↑ Kermode, Mark (January 11, 2015). "Into the Wood review". The Guardian. Archived from the original on July 3, 2015. Retrieved July 2, 2015. ↑ Labrecque, Jeff (January 15, 2015). "Oscars 2015: Full list of nominations". Entertainment Weekly. Archived from the original on January 15, 2015. Retrieved January 15, 2015. ↑ Gray, Tim (December 11, 2014). "Golden Globes: 'Birdman', 'Fargo' Top Nominations". Variety. Archived from the original on January 6, 2015. Retrieved January 15, 2015. ↑ "Nominees Announced for the 21st Annual Screen Actors Guild Awards®". SAG-AFTRA. December 10, 2014. Archived from the original on December 14, 2014. Retrieved January 15, 2015. ↑ Douglas, Edward (January 16, 2015). "The Winners of the 20th Annual Critics Choice Movie Awards". comingsoon.net. Archived from the original on January 19, 2015. Retrieved January 17, 2015. ↑ "Meryl Streep to Star in HBO's Master Class". Movie News Guide. July 14, 2014. Archived from the original on January 2, 2015. Retrieved November 29, 2014. ↑ Gettell, Oliver (April 2014). "TriStar lands Meryl Streep rocker movie 'Ricki and the Flash'". Los Angeles Times. Archived from the original on November 18, 2014. Retrieved November 11, 2014. 1 2 Abramovitch, Seth (August 1, 2014). "Meryl Streep Learning Guitar for Diablo Cody Movie". The Hollywood Reporter. Archived from the original on October 3, 2014. Retrieved October 17, 2014. ↑ "Ricki and the Flash". Rotten Tomatoes. Archived from the original on November 28, 2015. Retrieved November 29, 2015. ↑ Gettell, Oliver (February 20, 2014). "Meryl Streep to play British suffragette Emmeline Pankhurst". Los Angeles Times. Archived from the original on April 29, 2014. ↑ Formo, Brian (September 6, 2015). "Suffragette' Review: Fighting the Good Fight - Telluride 2015". Collider. Archived from the original on February 2, 2016. Retrieved February 21, 2016. ↑ Pulver, Andrew (October 14, 2015). "Meryl Streep gets Berlin's vote as president of film festival jury". The Guardian. Archived from the original on December 22, 2015. Retrieved December 20, 2015. ↑ Child, Ben (October 22, 2014). "Meryl Streep on for biopic of off-key opera singer Florence Foster Jenkins". The Guardian. Archived from the original on December 3, 2014. Retrieved November 11, 2014. ↑ "Meryl Streep in 'Florence Foster Jenkins' Biopic Debuts May 6 in U.K." Classicalite. February 16, 2016. Archived from the original on February 17, 2016. Retrieved February 17, 2016. ↑ Robbie, Collin (May 6, 2016). "Florence Foster Jenkins is the perfect antidote for sobering times – review". The Daily Telegraph. Retrieved July 18, 2018. ↑ "2016 Critics' Choice Awards: 'La La Land' Leads With 8 Wins Including Best Picture; Donald Glover Unveils Lando Calrissian 'Stache". Deadline. December 11, 2016. Archived from the original on January 18, 2017. Retrieved January 8, 2017. ↑ "Oscar Nominations: Complete List". Variety. January 24, 2017. Archived from the original on January 24, 2017. Retrieved January 24, 2017. ↑ "Golden Globes 2017: The Complete List of Nominations". The Hollywood Reporter. December 12, 2016. Archived from the original on December 13, 2016. Retrieved January 8, 2017. ↑ "SAG Awards 2017: The Complete List of Nominations". The Hollywood Reporter. December 14, 2016. Retrieved January 8, 2017. ↑ "La La Land dominates BAFTA nominations with 11 nods". Entertainment Weekly. January 10, 2017. Archived from the original on January 11, 2017. Retrieved January 10, 2017. ↑ Kroll, Justin (March 6, 2017). "Steven Spielberg, Tom Hanks, and Meryl Streep Team Up for Pentagon Papers Movie". Variety. Archived from the original on March 7, 2017. Retrieved March 6, 2017. ↑ Shepard, Jack (December 6, 2017). "The Post review round-up: Steven Spielberg's Oscar 2018 frontrunner wins glowing reception". The Independent. Archived from the original on December 6, 2017. Retrieved December 6, 2017. ↑ Han, Angie (December 6, 2017). "The reviews are in and critics absolutely adore Steven Spielberg's 'The Post'". Mashable. Archived from the original on December 6, 2017. Retrieved December 6, 2017. ↑ Manohla, Dargis (December 21, 2017). "Review: In 'The Post,' Democracy Survives the Darkness". The New York Times. Retrieved July 18, 2018. ↑ "The Post (2017)". Box Office Mojo. Retrieved July 18, 2018. ↑ Rubin, Rebecca (December 11, 2017). "Golden Globe Nominations: Complete List". Variety. Archived from the original on December 14, 2017. Retrieved December 11, 2017. ↑ "Oscars: 'Shape of Water' Leads With 13 Noms". The Hollywood Reporter. January 23, 2018. Archived from the original on January 23, 2018. Retrieved January 23, 2018. ↑ Owen, Gleiberman (July 17, 2018). "Film Review: 'Mamma Mia! Here We Go Again'". Variety. Retrieved July 18, 2018. ↑ Kroll, Justin (July 28, 2016). "Meryl Streep Joins Emily Blunt in 'Mary Poppins' Sequel". Variety. Archived from the original on August 1, 2016. Retrieved August 2, 2016. ↑ Carrie Wittmer (January 25, 2018). "Everything we know so far about HBO's 'Big Little Lies' season 2, including details about Meryl Streep's pivotal role". Archived from the original on February 6, 2018. ↑ Kit, Borys (May 14, 2018). "Meryl Streep to Star in Panama Papers Thriller for Steven Soderbergh (Exclusive)". The Hollywood Reporter. Retrieved May 15, 2018. ↑ Whipp, Glenn (July 3, 2018). "Exclusive: Meryl Streep will play Aunt March, not Marmee, in Greta Gerwig's 'Little Women'". Los Angeles Times. Retrieved July 5, 2018. ↑ Melas, Chloe (July 4, 2018). "Meryl Streep joins cast of 'Little Women'". CNN. Retrieved July 5, 2018. 1 2 Longworth 2013, p. 12. 1 2 Longworth 2013, p. 70. ↑ Longworth 2013, p. 73. ↑ Longworth 2013, p. 15. ↑ Halliday, Ayun (March 18, 2015). "Watch Meryl Streep Have Fun with Accents: southern American, Bronx, Polish, Irish, Australian, Yiddish & More". Open Culture. Archived from the original on May 13, 2015. Retrieved May 13, 2015. ↑ "How Barbra Streisand music inspired Meryl Streep". examiner.com. Archived from the original on February 6, 2012. Retrieved February 7, 2012. ↑ "Meryl Streep: The Fresh Air Interview". NPR. Archived from the original on April 2, 2015. Retrieved February 6, 2015. ↑ "How Barbra Streisand music inspired Meryl Streep". NPR. Retrieved February 7, 2012. 1 2 Allison & Goethals 2013, p. 3. ↑ Sawer, Patrick (January 8, 2012). "How Maggie Thatcher was remade". The Telegraph. Archived from the original on January 21, 2015. 1 2 Elliott et al. 2011, p. 180. ↑ https://www.youtube.com/watch?v=78GaH2P0rnE&t=122, segment of interview at a gala dinner at the Old Museum of Arts Centre on 18 August 2007. ↑ Newsletter (August 20, 2007) Oscar winner boosts new arts centre plan Archived June 5, 2012, at the Wayback Machine. Johnston Publishing. Retrieved December 6, 2011. ↑ "2004 Meryl Streep Tribute". American Film Institute. Archived from the original on July 6, 2015. Retrieved May 13, 2015. ↑ "Portuguese Music Charts". Archived from the original on December 1, 2011. ↑ "People Choice Awards Results". People's Choice Awards. Archived from the original on October 27, 2009. ↑ Martin, Sami K. "Meryl Streep Lands First 'Vogue' Cover". The Christian Post. Archived from the original on January 18, 2015. ↑ Braun, Liz (December 20, 2014). "Meryl Streep gets her groove on for 'Into the Woods'". Toronto Sun. Archived from the original on January 22, 2015. The Grammy-nominated singer (for Mamma Mia!) talks about a Broadway gig in the past. ↑ "The One and Only Shrek". Macmillan Publishers. Archived from the original on October 16, 2015. Retrieved July 2, 2015. ↑ "About". National Women's History Museum. Archived from the original on November 5, 2011. Retrieved January 11, 2012. ↑ "Meryl Streep donates $1M to The Public Theatre". Yahoo News. Archived from the original on October 8, 2012. Retrieved October 6, 2012. ↑ Karmali, Sarah (February 28, 2013). "Beyoncé Leads New Gucci Empowerment Campaign". Vogue. Archived from the original on August 16, 2017. Retrieved April 22, 2013. ↑ "Meryl Streep at UMass Lowell Chancellor's Speaker Series". www.uml.edu. UMass Lowell, Massachusetts, USA. April 1, 2014. Archived from the original on April 8, 2017. Retrieved April 7, 2017. ↑ Gordon Cox (April 19, 2015). "Meryl Streep Funds Lab for Women Screenwriters Over 40". Variety. Archived from the original on April 28, 2015. Retrieved April 28, 2015. 1 2 Inkoo Kang (April 20, 2015). "Meryl Streep Launches Fund for Women Screenwriters Over 40". Blogs.indiewire.com. Archived from the original on April 24, 2015. Retrieved April 28, 2015. ↑ Tracy McVeigh (March 7, 2015). "Poverty is sexist: leading women sign up for global equality | Life and style". The Guardian. Archived from the original on May 18, 2015. Retrieved May 8, 2015. ↑ Inae Oh. "Meryl Streep Is Pushing Congress to Finally Revive the Equal Rights Amendment". Mother Jones. Archived from the original on June 26, 2015. Retrieved June 25, 2015. ↑ Derschowitz, Jessica (February 23, 2015). "Meryl Streep to Congress: Revive the Equal Rights Amendment". Entertainment Weekly. Archived from the original on June 25, 2015. Retrieved June 25, 2015. ↑ Telegraph Reporters (March 8, 2016). "Meryl Streep, Amy Poehler and Elton John pen letter to world leaders to 'end gender inequality'". The Telegraph. Archived from the original on March 11, 2016. ↑ "Oprah, Charlize Theron, Meryl Streep sign open letter". GulfNews. Associated Press. Archived from the original on March 21, 2016. ↑ Littleton, Cynthia (January 1, 2018). "Hollywood A-Listers Launch Time's Up Initiative to Fight Sexual Harassment Across the U.S. Workforce". Variety. Archived from the original on January 4, 2018. Retrieved January 4, 2018. ↑ "Meryl Streep backs campaign to free Ukrainian filmmaker Oleg Sentsov - Apr. 30, 2017". April 30, 2017. Retrieved March 5, 2018. ↑ Topping, Alexandra (December 27, 2011). "Meryl Streep develops admiration for Margaret Thatcher after starring role". The Guardian. New York City: Guardian Media Group. Archived from the original on November 16, 2016. Retrieved November 15, 2016. ↑ Fallon, Kevin (July 27, 2016). "Meryl Streep's Ecstatic Hillary Speech at the DNC: 'It Takes Grit, and It Takes Grace'". The Daily Beast. New York City: IAC. Archived from the original on July 28, 2016. Retrieved July 27, 2016. ↑ Lee, Ashley (January 8, 2017). "Golden Globes: Meryl Streep Talks Immigration, Takes Aim at Donald Trump in Passionate Speech". Hollywood Reporter. Los Angeles, California: Eldridge Industries. Archived from the original on January 9, 2017. ↑ Gleiberman, Owen (January 31, 2017). "Why It's Okay for the Oscars to Get Political". Variety. Los Angeles, California: Penske Media Corporation. Archived from the original on February 8, 2017. Retrieved February 7, 2017. ↑ Barraclough, Leo (January 9, 2017). "Donald Trump Lashes Back at Meryl Streep, Calls Her an 'Overrated' Actress". Variety. Los Angeles, California: Penske Media Corporation. Archived from the original on October 13, 2017. Meryl Streep, one of the most over-rated actresses in Hollywood, doesn't know me but attacked last night at the Golden Globes. She is a Hillary flunky who lost big. ↑ Shoard, Catherine (15 June 2018). "Ocean's 8 stars blame dominance of male critics for film's mixed reviews". The Guardian. London, England: Guardian Media Group. Retrieved 16 June 2018. ↑ McFarland, Kevin (March 12, 2013). "On the anniversary of his death, revisit John Cazale's tragically short film career in I Knew It Was You". The A.V. Club. Archived from the original on July 1, 2015. Retrieved June 24, 2015. ↑ The Lewiston Daily Sun, October 3, 1978. Google News. Retrieved November 24, 2011. ↑ Osterhout, Jacob E. (May 15, 2011). "Almost famous: His mom may be an icon, but musician Henry Wolfe is making a name of his own". New York Daily News. Archived from the original on December 24, 2013. Retrieved March 27, 2014. ↑ Longworth 2013, pp. 94, 99, 175. ↑ Abramowitz 2002, p. 414. ↑ Muller, Marissa G. (May 12, 2016). "Billie Lourd Is The Best Friend We Wish We Had". magazine. Archived from the original on January 4, 2017. Retrieved January 4, 2017. ↑ "Movies, Marriage, and Turning Sixty'. The Independent. January 24, 2009. 1 2 Brown, Mick (December 4, 2008). "Meryl Streep: mother superior". The Week. London. Archived from the original on December 10, 2008. Retrieved December 4, 2008. Haskell, Molly (May–June 2008). "Finding Herself: The Prime of Meryl Streep". Film Comment. Archived from the original on March 9, 2009.